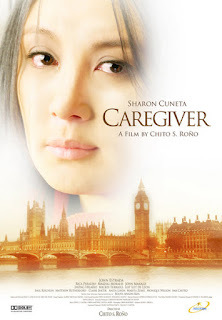 Caregiver (2008) is a movie directed by no other than Chito S. Roño. This movie is starred by our very own Mega Star Sharon Cuneta, John Estrada, Boots Anson-Roa, Ima Castro, Lotlot De Leon, Nikki Feriols, Rica Peralejo, Makisig Morales, etc. Chito Roño’s “Caregiver” (scripted by Chris Martinez) is a movingly realistic tribute to Filipino OFWs especifically Caregivers who put up with all sorts of hardships and indignities to make money for the loved ones they’ve left in the Philippines. There have been other such movies in the past, but Roño’s film is better than most, because of its sometimes acutely raw realism. The film follows the story of Sarah (Sharon Cuneta), a teacher who leaves her son behind so she can join her husband Teddy (John Estrada), who’s working as a nurse in London. She trains as a caregiver so she can help her husband generate enough income to raise the “show money” needed to eventually bring their son over, so they can become a real family again. Alas, her dream of family unity is shattered when she’s quickly traumatized by her yucky duties as a caregiver, which include having to deal with the smelly mess that her incontinent wards at an old folks’ home constantly create. She’s also turned off by her husband’s spendthrift ways and generally peevish attitude, which eventually prompt her to make a big decision at film’s end. Along the way, she gets to interact with a number of Filipinos living and working in London, as well as some generally surly and unappreciative English patients. What will happen to their plans when one of them quits?